It happened one morning when the Temple courts were filled with people going to the service. Peter and John were staying in Jerusalem, so they too left their work and went together at prayer time to the Temple. The two friends walked through the courts and up the steps that led to the Temple door. As they were going in someone spoke to them. "Pity a lame man," said the voice. Peter and John stopped to look. Sitting on one of the steps was a beggar man. He could not walk, nor had he ever walked; for ever since he was a baby, he had been quite lame. 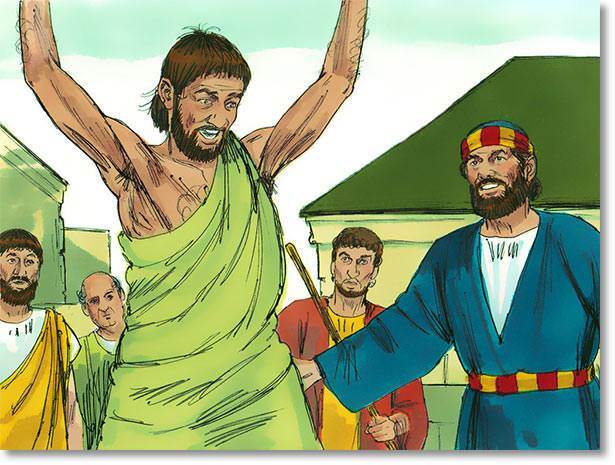 Peter and John had often seen that lame man. They knew that his friends carried him every day to the doors of the Temple but he had not come to pray. He could do no work, so he begged from all who entered the Temple doors. Peter and John were sorry for the lame man. They wished they could make him happy. Suddenly Peter remembered Jesus, their Friend. He would have made the beggar man strong and well. If only Jesus were with them! Then Peter thought again, "But Jesus is here. He is with us all the time, although we cannot see Him." 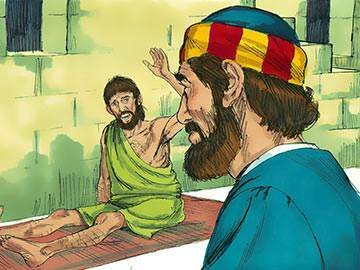 The beggar man was glad when Peter then spoke to him saying, "Look at us." "He is going to give me money," he thought. But Peter said, "Silver and gold have I none, but what I have I will give. 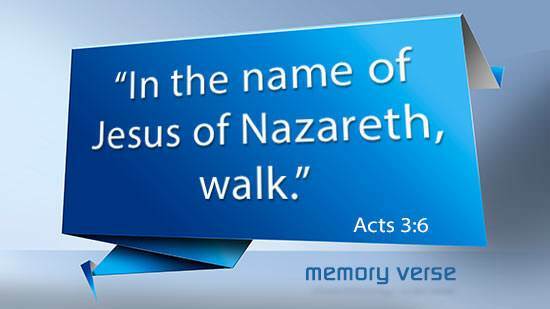 In the name of Jesus, get up and walk!" Then he stooped down, caught hold of the lame man with his strong right hand, and lifted him on to his feet. 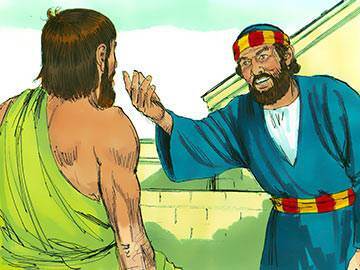 The lame man had never stood upon his feet before, but when he felt Peter’s strong hand and heard his kind voice he stood up. At once his feet and legs became strong, for all his lameness had gone! Peter and John stood watching while the lame man walked and jumped about for joy. Peter was full of happiness too. He was glad that he had been able to heal a poor lame beggar just as Jesus, his Friend had healed people.